The Witches' Cauldron: A gorgeous beach and photo-ready sunset don't necessarily put us in a scared, w-w-what-was-that-noise frame of mind. But that all changes once we start sipping out of a wee cauldron. Because, it's a cauldron. Not your typical, everyday glassware. Downright festive, in fact. The cauldron-based cocktail's at... The Beachcomber in Malibu. What's in it: 151 rum -- Happy Halloween! -- the juices of the orange and the mango and the pineapple, plus banana rum. Other seasonal sips on the menu: The Cat's Eye, which has a lemon-y pucker. The Zombie is filled with vvvvodka, grunt, and a gummi worm. And Black Magic has a creamy, dessert-yummy thing going down, thanks to the vanilla vodka and Godiva chocolate. And the Frisky Witch is frisky thanks to a vodka-cucumber mash-up, and a tiny broom made out of a cuke. That's going the distance. Price: $9, for every Halloween concoction. The time is... Now. Or is saying "the time is nigh" far more Halloween-ish? October 31st approaches. 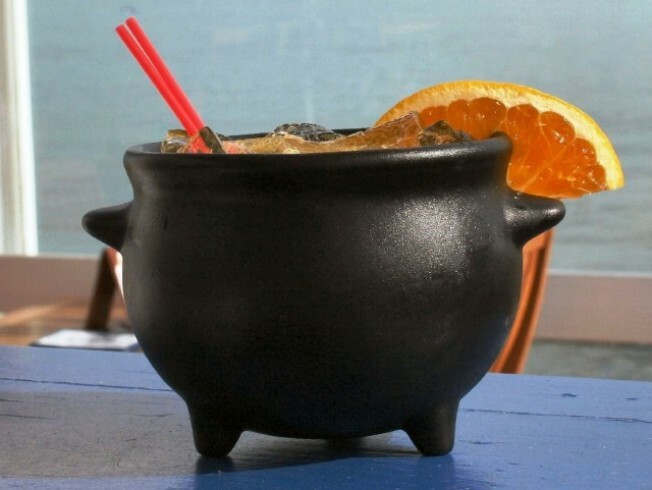 The Witches' Cauldron won't be roiling with rum long past that devious date.